Will opening Richardson Grove spell catastrophe or salvation? Just north of the Golden Gate Bridge, on the west side of U.S. Route 101, is an old, wooden sign that says "Redwood Highway." The sign blends into its surroundings, and is easy to miss; it marks the beginning of the 438-mile-long stretch of road — from San Francisco to Grants Pass — that weaves through an area once enveloped by a great, primeval forest. If you don't leave the highway, though, you have to travel nearly 200 miles before truly experiencing that now-mythic wood. At the Humboldt County line, Highway 101 narrows down to two lanes, wending its way through a state park that remains secluded in shadow even on the sunniest days. When this section of the road was built, in 1915, there were only 2.5 million registered cars in the entire country, the Save-The-Redwoods League was still in its nascent stages, and the park's namesake, Friend Richardson, had not yet been elected governor of California. Richardson Grove "is the gateway to the North Coast and to the Redwood Curtain," Caltrans District One Director Charlie Fielder said on Feb. 20, when about 150 people packed a meeting at the Wharfinger Building. 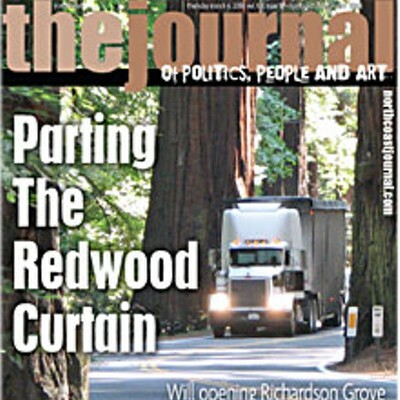 And, ever since Caltrans unveiled its proposal to realign the stretch of 101 that passes through Richardson Grove in order to allow industry-standard trucks to enter Humboldt County, the grove has become much more: the crux of a debate, to lift a campaign slogan from a certain presidential candidate, about "the past ... versus the future." The realignment proposal was first introduced at a Sept. 27 open house at the Benbow Valley RV Resort, where, over the course of three hours, about three dozen Southern Humboldt and Northern Mendocino residents trickled in to pore over publicity materials and project maps. Caltrans representatives on hand to answer questions included Fielder, Project Manager Kim Floyd and Senior Environmental Planner Deborah Harmon, all of whom professed unbridled enthusiasm about the minimal amount of work needed in order to meet safety standards. By Caltrans norms, the proposed plan is almost laughably small: two months' work performed over a mile-long stretch of road, at a total cost of $5 million. The project area is divided into three sections, with the southernmost point on State Parks property, north of the Hartsook Inn, and the northernmost point at Singing Trees Recovery Center. 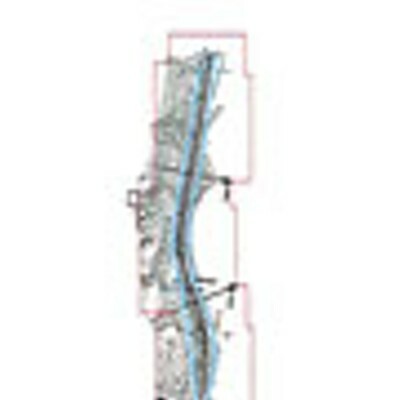 Section 1, in the south, is where most of the realignment would take place; Section 2 would involve repaving only; and Section 3 would include some minor realignment, removal of a number of small trees on a slope across the highway from Singing Trees, and the construction of a retaining wall there. The only sizable portion to be realigned is on the east side of the highway, north of mile post marker 1.35. Here, on a stretch of road that's roughly 100 to 150 feet long, a lane-width's worth of pavement would be added, with the centerline realigned accordingly. In five other locations in Section 1 — three on the east side of the highway, two on the west — the road would be slightly realigned in order to enable industry-standard-sized trucks, as defined in the Surface Transportation Assistance Act (STAA), to safely round the curves. According to Caltrans, in the five-year time period between July 1, 2002 and June 30, 2007, 13 collisions involving commercial trucks occurred in the grove; of those, seven were multi-vehicle accidents, and two involved trucks hitting spilled loads. "It's misnomered as a 'widening' project," Harmon said on Sept. 27. "We're actually realigning the areas just before you get to the trees, and basically lining the trucks up in the such a way that they can get through safely." 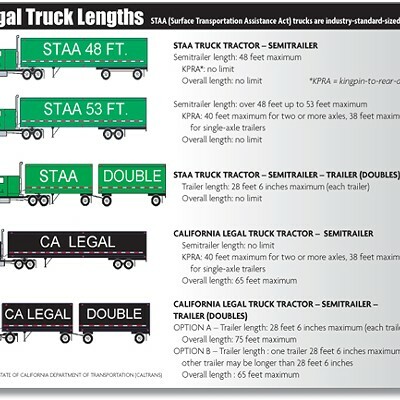 Like the plan, the difference between trucks that are legally allowed through the corridor and those that are not might seem minute: Currently, the trucks allowed have a 15-foot cab and a 45-foot trailer, with a 20-foot wheelbase, while the smallest standard-sized trucks have a 16-foot cab and a 48-foot trailer, with a 25-foot wheelbase. Why does it matter? Because — according to numerous Humboldt County business owners who have spoken out in support of the project — the regulations cost them millions of dollars each year in offloading costs, and safety issues have long plagued truckers making the trip through 101. 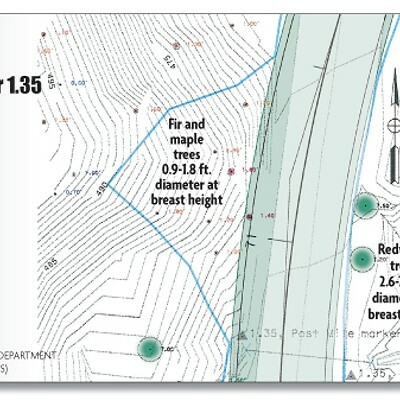 And here's the clincher: Caltrans says not a single old-growth redwood tree will be removed. Most of the trees cut will be tanoaks, maples, and bay laurels, but the agency still can't say how many. "The existing alignment dates from 1915, when the original highway was planned," Project Engineer Eric Lund explained at the Feb. 20 meeting; at that time, it was part of LRN (Legislative Route Number) 1, becoming signed as U.S. Route 101 in the mid-1930s. With the exception of "asphalt rehabilitation," to use the industry jargon, virtually no work has been done in Richardson Grove since the road was first built. Lund said little survives of the original plans, and only one survey was conducted between 1915 and 2006. After the 2006 survey was completed, he explained, Caltrans used AutoTURN — described by its maker, Transoft Solutions, as "the world's foremost vehicle turn simulation software" — to map where "conflict" existed between vehicles and hard objects, such as trees and embankments. The realignment plan isn't, of course, the first one to be proposed as a solution to both the commercial and safety issues in the area. "Highway improvements to U.S. Route 101 at Richardson Grove have been an issue for Caltrans since the mid 1950s," District One Public Information Officer Julie East wrote via e-mail on Feb. 21, in response to questions from this reporter. "At that time, a four-lane freeway/expressway was the concept for 101. It was in September 2001 that a study concluded it was not feasible due to costs (ranging from $100 to $600 million at that time) and environmental issues associated with a bypass. Alternatives included options through the park, as well as alignments that would cross the Eel River in multiple locations." "In October 2002," East continued, "after public input, the Route Concept for U.S. Route 101 was revised ... In April 2005, a Safety and Commerce Study was completed by Caltrans and approved by Humboldt County, the California Highway Patrol, Mendocino County, California Parks and Recreation, and Caltrans ... The proposed Richardson Grove project was initiated as a result of the April 2005 study. " Even so, the project won't conform to current standards applied to new roadways, Lund conceded at the Feb. 20 meeting, "but we'll incrementally increase safety. We cannot fix the proximity to the trees." 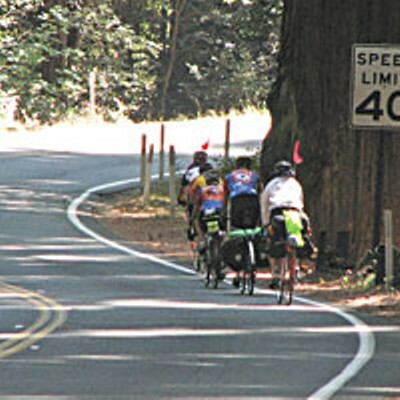 Caltrans further maintains that Richardson Grove presents the last hurdle in having a north-south route through the North Coast (a major project is already under way in the other trouble spot, Confusion Hill) — and that, in presenting a "minimum-impact" plan, the agency is doing precisely what the public directed it to do. And, while Harmon and Floyd both acknowledged that the Humboldt Cattlemen's Association "has been the most vocal" about getting the work done on 101, they dismissed the idea that the project is being undertaken to appease the demands of a few: "We've heard from a lot of local businesses about what a problem it is," Floyd said at the Feb. 20 meeting. At any rate, per Senate Bill 773 — passed two weeks after the Benbow open house — the cattlemen had their exemption renewed, allowing truckers working with them to bring the industry-standard trucks in and out of the county. The battle has moved on to greener pastures. While local environmentalists had begun discussing their worries about the proposal shortly after the Sept. 27 meeting, their concerns weren't clearly outlined until Nov. 20, when Greg King — the executive director of the Northcoast Environmental Center — submitted a detailed letter to Caltrans, questioning the agency's decision to forgo a full environmental impact report for the project. According to Caltrans, preliminary studies indicated that environmental impacts would be minimal, negating the need for a full EIR. In his letter, King took issue with Caltrans' position. He thought that the agency's proposed environmental review — a "negative declaration" of environmental impact under state law and a cursory "environmental assessment" under federal law — didn't account for the project's potential impact. "[They] are insufficient mechanisms for exploring the very real possibility of potentially significant adverse cumulative environmental impacts of this project to the ancient redwood grove and the wildlife that lives there, and to Humboldt County as a whole," he wrote. King further argued that, in addition to CEQA and NEPA, "adherence to the state and federal Endangered Species Acts, the Clean Water Act, state and federal Transportation Acts and the Clean Air Act" are also of concern — as are potential negative impacts in the grove's sensitive environment: "Dr. Steve Sillett, a noted redwood expert and professor at Humboldt State University, states, 'I'm very interested in why tall trees die back along roadways ... In some groves, waterlogging from impeded drainage seems to have killed the tops. In others, water stress from road-induced desiccation may be the culprit.'" 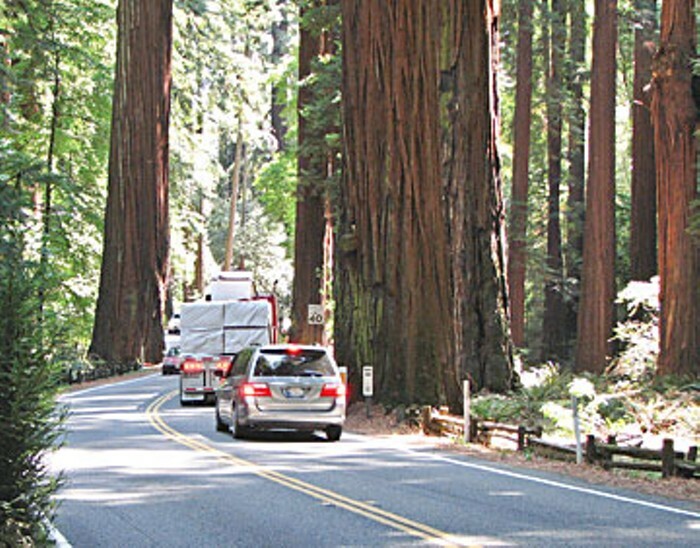 Since Caltrans' planning documents state that the road's drainage systems would have to be modified, King further argued that the agency "must consider using the EIR/EIS process to conduct just a study of the impacts of road construction on redwood trees, a study Caltrans should have commissioned many years ago." But so far, Caltrans has steadfastly refused to commission a full Environmental Impact Report: "Both Caltrans and the FAA have a policy of having a level of study commensurate with the level of impact," Harmon said at the Wharfinger meeting. "And we have not determined, under CEQA, that there will be such impacts." On a different note, King further objected to the fact that the project does not "provide safe access through the corridor for pedestrians and bicycles," per State Highway Code 887.8(b): "Where the traffic safety or capacity of the highway would be increased, the department shall pay for the construction and maintenance of non-motorized transportation facilities approximately paralleling the highway." Several people at the Feb. 20 meeting questioned the lack of a bicycle path in the proposal: "The road right now is terrifying for bicyclists, and will be even worse with the changes," said one man who asked if Caltrans would be able to secure funding for such a path. Caltrans referred the question to California State Parks, which is currently exploring the possibility of a path through the park itself. Following closely on the heels of King's letter, the Environmental Protection Information Center submitted its own comments to Caltrans, which largely mirrored King's concerns. And after the Benbow meeting, Southern Humboldt environmentalists began thinking about the numerous ramifications of opening the grove, and closely examining their own worries. On Jan. 10, the first of what would become a regular series of meetings was held at Friends of the Eel River in Garberville. A host of issues was addressed, in addition to those spelled out in King's correspondence: greater potential for spills in the grove; potential effects of more vehicle exhaust in the grove; the role of community members who volunteer as emergency-services personnel; possible challenges of increased traffic, without the infrastructure to support it; and possible safety issues, should a straighter road translate into driving at higher speeds. All those concerns were expressed at the Feb. 20 Wharfinger meeting, where there was seemingly a counterpoint to each argument presented. While several people expressed concerns about increased pollution in the grove, others argued that those problems should be alleviated in 2010, when new fuel-emission standards go into effect. "We're a big company," said Vince Thomas of the Sun Valley Group, "650 employees, one of the biggest cut-flower companies in the U.S. Our freight costs alone add up to about $2 million a year." Thomas then explained that a recent study conducted by the company revealed that, if it were to switch to modern, fuel-efficient trucks only, Sun Valley would not only save a considerable amount of cash — it would reduce its annual pollution by 1.3 million pounds of carbon dioxide. Rex Bohn, Vice President of Resources for Evergreen Pulp, echoed Thomas: "We spend $25 million a year on transportation ... This isn't a willy-nilly thing. It's been going on for 30 years." Concerns about increased noise were met in similar fashion to those about pollution: "The next time you pull up alongside one of the new trucks, roll your window down," said Rob McBeth of O&M Industries. "There's no comparison with the old trucks — they're so much quieter." Outside of the strictly environmental concerns, though, King touched on one point that — for many of those opposed to the project — may be the sorest one of all: the economic argument. While Caltrans maintains that "communities with routes unable to provide STAA access are at an economic disadvantage," King argued that the agency has not provided documentation proving that allegation, and should do so as part of a complete EIR. Further, "Caltrans is specifically disallowed from creating projects that would induce growth," he alleged. "Expansion of the commercial sector involving chain stores must be considered 'growth.' Also, such expansion will have a negative impact on existing retailers." The big-box argument is seemingly predicated on the notion that, if STAA-standard trucks have a point of entry through Richardson Grove, so will Wal-Mart, Home Depot and their ilk. Of course, Humboldt County already has at least two big-box stores — Costco and Target — but the real fear is that, given free access via 101, they will proliferate like weeds, and the North Coast's rural charm will be lost. In other words, we'll succumb to Santa Rosification. "It's old-paradigm thinking," said one woman at the Wharfinger meeting. "Instead of 'bigger and better' always being the push, why not concentrate on our local resources? Buy grass-fed beef here!" The story was too good not to be repeated — at least one earnest KMUD programmer did so on the air — and the flourishes added to it were mildly amusing: visions of the Governator skipping hand-in-hand through the fern undergrowth with Eureka's bad boy, singling out which old-growth trees would be cut down, were hard to resist. They were also the products of hyperactive imaginations: The story apparently originated with a local contractor musing about such a meeting — and then someone ran with it, and in short time it became "fact." Unfortunately, it's precisely the sort of thing that grievously detracts from the real issues at hand, and undermines the otherwise cogent arguments of people questioning the validity of the project. And on that point, the view of at least one prominent Humboldt County resident is that it's not an issue to be settled by Caltrans — but rather, through the oft-discussed, much-disputed General Plan. "As you may remember, I was the co-chair that stopped Wal-Mart coming into Eureka," Fourth District Supervisor Bonnie Neely told KMUD News reporter Daniel Mintz after the Feb. 20 meeting. "And the best way to stop big box is to make sure that there are policies in the General Plan. There are general plans being reviewed right now by the County of Humboldt, Fortuna and I believe also in Eureka. So if you don't want big box in your neighborhood, support good policies that stop that type of layout conversion." Neely added that the proposal is "a real opportunity to make this road safer, and [for] local businesses to get their goods out of the county in a cost-effective way. I think it'll be good for tourism too, because I think there'll be less trucks on the road." Down in the Second District, where the work would be done, neither of the candidates looking to unseat Roger Rodoni is eager to jump into the fray quite yet. At a Nov. 14, 2007, meet-and-greet at the Garberville Civic Club, Fortuna apple farmer Clif Clendenen told the assemblage that, having initially been a supporter of the Richardson Grove proposal, he had reconsidered his position upon hearing opposing viewpoints, and would need to learn more before commenting further. And during her Feb. 27 campaign kickoff event at the Garberville firehouse — attended by an estimated 150 people — former KMUD News Director Estelle Fennell said that, while she fully understood the concerns of environmentalists, she's also acutely aware of the challenges faced by independent businesses in the county. In the Northern Humboldt business community, support for the proposal appears to be overwhelming. "We've been talking about this issue since 1999, when I got here," Greater Eureka Chamber of Commerce Executive Director J. Warren Hockaday said on Feb. 29. "From our perspective, it really affects everybody — virtually every project, material or supply has an additional cost attached to it." Pending release of the draft environmental document, the Chamber board "is strongly behind it," Hockaday added. In that vein, the Humboldt County Community Development Services office recently conducted a survey of Humboldt and Del Norte County businesses, in which it asked them whether truck-size restrictions affect their import and export businesses, costs associated with transportation, delivery delays and ability to expand business into larger markets, create jobs and raise employees' wages. According to Economic Development Coordinator Jacqueline Debets, the survey results have been used as the basis of an economic impact study compiled by Chico State University, to be released this week. Among other findings, it indicates that the county is directly impacted to the tune of $4.5 million annually, and loses an additional $10 million a year "in lost opportunities." According to several people who spoke at the Feb. 20 meeting, the biggest problem associated with restricted access is the cost of offloading — which, according to STAA standards, must be done at Crescent City, Redding or Leggett. And, with higher fuel-emissions standards right around the corner, business owners and truckers alike argued that come 2010, only the longer (though not heavier), standard-sized trucks will be built, and maintenance for smaller trucks will become prohibitively expensive. That scenario presents yet another paradox: that, with access closed to standard trucks, only the wealthy corporations — in other words, the big-box stores — will actually be able to afford the cost of offloading, and independent businesses will be crippled. According to Rob McBeth, costs incurred by local companies aren't limited to offloading — they mount for time wasted, as well, especially by inexperienced, out-of-the-area drivers who get stuck in places like Ukiah and accumulate food and boarding costs on top of offloading ones. And the safety concerns weigh heavily on many with driving experience: "I hit one of those trees when I was 19," Rex Bohn said. "If there was another, easier way, we would have done it by now." Not everyoneis convinced by those arguments, though. "As far as I'm concerned, this is all a big waste of money," Riverwood Inn owner Loreen Eliason said at the Wharfinger meeting. "If you want to spend money to make money, focus on tourism! I constantly see money go into highway projects, but not into beautification ... Why not put money into Buckhorn [Summit, on Hwy 299]?" Eliason has long vocalized her frustration with state agencies' seeming inability to procure much-needed funds for both public restrooms and road repairs on the Avenue of the Giants, which has been the site of a number of serious accidents — including at least six fatalities in the last two years alone. Further, she questioned the impetus for the project: "Who are the stakeholders?" According to East, "the traveling public is the ultimate stakeholder." But a number of other entities are as well, including the county, State Parks, the U.S. Fish and Wildlife Service, the California Department of Fish and Game, the Regional Water Quality Control Board, the U.S. Army Corps of Engineers, the Sinkyone Intertribal Wilderness Council and the State Office of Historic Preservation. East added that, since the Sept. 27 meeting, "Caltrans has met with numerous interested individuals and organizations, such as the NEC Board of Directors, the Prosperity Network and the Eureka Chamber of Commerce." Eliason was not alone in expressing frustration about long-neglected roads, or the seeming inevitability of the project. "It is going to happen, from the language you're using," said another concerned resident at the Feb. 20 meeting. "I live in Manila, where we've been begging for safe crosswalks for kids for the last 15 years ... and we're told it's not economically feasible. The community said no to widening 101 in the '60s, and to the bypass in 2000. What is your commitment to the democratic process, and what the majority of this county's residents want?" In response to Eliason's concerns, East responded: "Caltrans is currently repairing storm damage on Route 254 [the Avenue of the Giants] ... [and] multiple areas of storm damage repair are in the planning phase. There are also culvert replacements being planned near Phillipsville, and a project which will widen four bridges and replace the bridge rails." As for Manila, "Caltrans made safety improvements to Route 255 in 2007, [including] striping and delineation. We have no current plans for additional projects in this area; however, Caltrans initiates new projects on a regular basis." And 299? On the road from Redding — which is arguably as scenic, curvy and dangerous as 101 — a fully funded project is out of the question, Caltrans District Two Public Information Officer Michael Mayor said: According to a study conducted by the agency, the estimated cost of making the entire route "Freightliner-safe" is about $250 million. Caltrans is, instead, investing in substantially smaller projects on the road, including a $4 million realignment of some of the sharp turns on a half-mile stretch near Buckhorn Summit. The project is going up for bid soon, and is slated for completion this summer. Reaction fromthe businessowners who would be most affected by the project has been wary. "All I know is, the solution to this is a bypass across the river," Singing Trees owner Patti Watson said at the Wharfinger meeting. "It should have been done 20 years ago, when it would have cost only $150 million or whatever ... And what kind of wall are you going to build?" Not only is Watson's business across from the proposed location of the wall — her home is below it as well. On that note, another audience member questioned the value of "yet another graffitied wall in the county," to which East responded that the purpose of the proposed Richardson Grove retaining wall — which was added to the proposal after the Sept. 27 meeting — is "to minimize impacts to trees, endangered species, and property owners." Dan Baleme, owner of One Log House Espresso & Gifts, expects to close his business and lay off his employees while the project is completed. Why? "Caltrans has never been good at communicating with local businesses," he said on Feb. 28. "Our business went down to about 10 percent of normal the other day, when they were doing core samples; they blocked the road right at [the Grandfather Tree] with a flagman, so my driveway was blocked." Baleme further alleged that repeated attempts to address more efficient traffic control have gone unheeded by Caltrans. On a different note, Baleme asserted that currently, "the 53-foot trucks go through the grove all the time, maybe 10 a day. They almost never get caught; when they do, it's because they've been pulled over for some other violation." Paradoxically, he feels that closing his business would be worth it, if the proposed project was more substantive. "They're not going to remove any of the trees that really address safety; they're just going to meet the letter of the law. I wouldn't mind if they were really going to do something, but I see the project, as it is, as a waste." Baleme's neighbor Keith Bowman, owner of Cook's Valley Campground, the Grandfather Tree, and the Patriot fuel station, isn't opposed to the project, but agrees with Baleme's point of view: "I can't hardly picture that it'll make that much of a difference," he said, noting that, ironically, Southern Humboldt locals "seem to have forgotten that in the 1980s there was a big row of eight redwood trees, right next to the white line at the Hartsook Inn. The state came in and took those out, and now people who drive past the spot forget that they were ever there. What they're doing now is nothing." Ultimately, the controversy hinges on each stakeholder's vision of the area's future. Should Humboldt County residents look inward, and keep their beef and dairy products strictly local — or should they encourage businesses such as Arcata's Cypress Grove to keep reaching outward, and export their goods? Should the fact that 101 is inaccessible to STAA trucks be a source of pride, or a source of shame? Should we approach the concept of an increasingly globalized economy with fear — for which there are many valid reasons — or with hope, for which there might be just as many? Every person who has spoken out about the Richardson Grove proposal believes strongly in his or her own vision for that future, and every one hopes approval of the project is not a fait accompli — that the Powers That Be will consider all those visions, and that in the end, the final decision will be the result of a democratic, albeit thorny, community process. But Dan Baleme, for one, isn't holding his breath. "Caltrans is like an earthquake," he concluded with a weary laugh. "You can't really do anything about it — you just prepare for the aftermath." Caltrans will release a draft environmental document in April, at which point it will invite further public comment and hold another round of public meetings. More information is available at www.dot.ca.gov/dist1/d1projects/richardson_grove.